Review: I loved book 3 in the series and this was really disappointing. The pacing was slow and as a result the book was very boring. I had to force myself to read every night just to finish it. I understand books 4 & 5 were initially one giant book that were split up, as a result there were no sections written from my favorite characters (Tyrion, Jon Snow, Dany). I thought Brienne's sections would be really fun....but instead we heard her repeat over and over (what seemed like a hundred times) "I'm looking for a highborn maid of three and ten, with a fair face and auburn hair." A lot of the book was focused on Dorne and the Iron born. While some of this was interesting, it was a little frustrating that we're almost 3k pages into the story and this is the first time we're meeting these people. I was mad (yes, mad) when Caitlyn Stark showed up again. I wish Martin had killed her off at the red wedding. Now, on to what I did like. I did enjoy Cercei (just as evil and twisted as we all thought) and Jamie (he continues to redeem himself). Also, Alayne (Sansa) parts were interesting since we got to see what Littlefinger is up to. I think he is one of the most fascinating characters in the series. 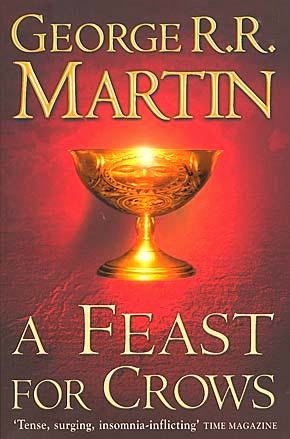 My least favorite in the series so far, but I have high hopes for book 5.